The Coat of arms of Romania was adopted in the Romanian Parliament on 10 September 1992 as a representative coat of arms for Romania. It is based on the Lesser Coat of Arms of the Kingdom of Romania (used between 1922 and 1947), redesigned by Victor Dima. As a central element it shows a golden aquila holding a cross in its beak and a mace and a sword in its claws. It also consists of the three colors: red, yellow, and blue, which represent the colors of the National Flag. The idea behind the design of the Coat of arms of Romania dates since 1859, when the two Romanian countries, Wallachia and Moldavia united under Alexander John Cuza (common English rendition of Alexandru Ioan Cuza). Then the two heraldic symbols, the golden aquila and the aurochs, were officially juxtaposed. 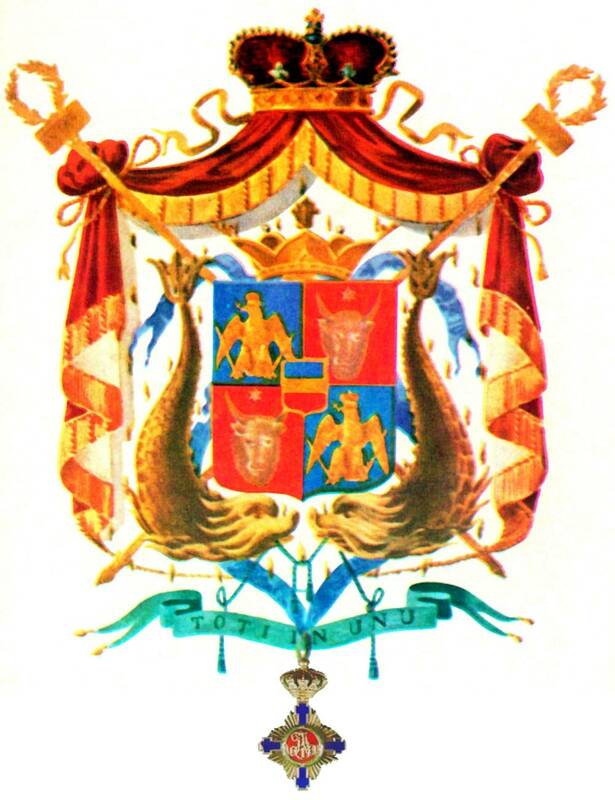 Until 1866 there were many variants of the coat of arms, regarding the background color and the number of times the two main elements where represented. 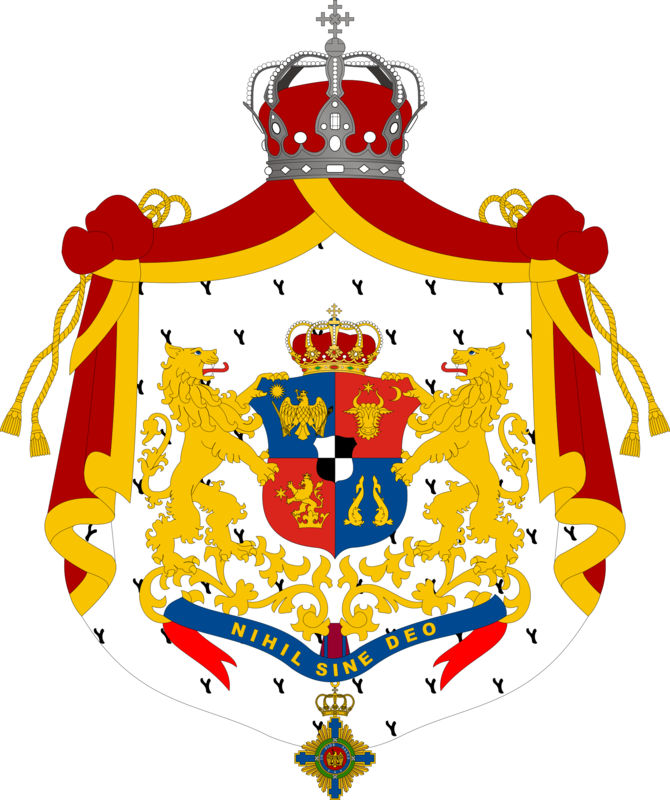 In 1866, after Carol I was elected Prince of Romania, the shield was divided into quarters: in the first and fourth an eagle was depicted, and in the second and third the aurochs; above the shield the coat of arms of the reigning Hohenzollern-Sigmaringen Family was placed. 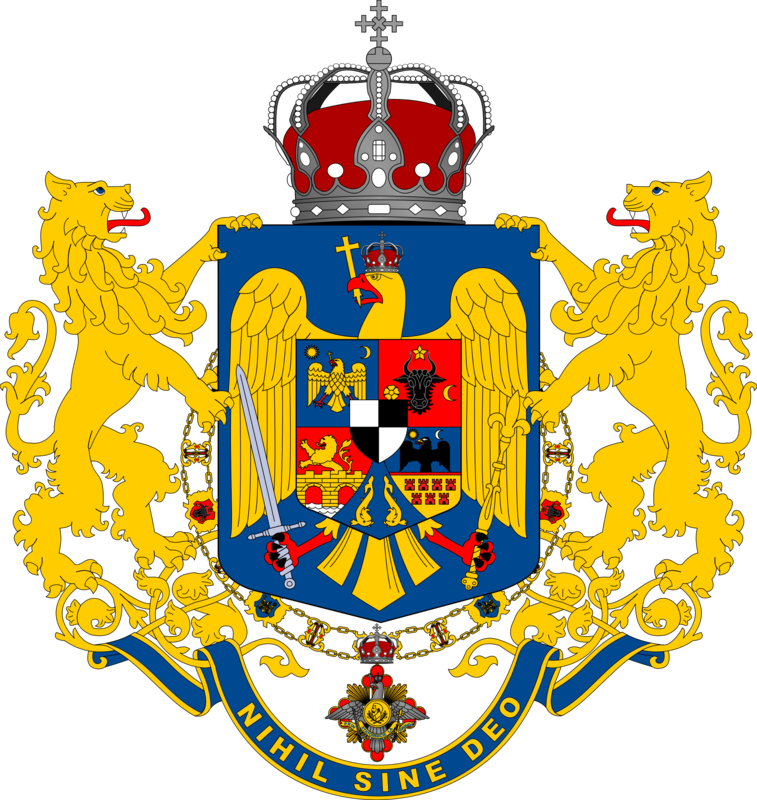 After the 1872, the coat of arms included the symbol of Dobruja, two dolphins in the fourth quarter, and the one of Oltenia, a golden lion, in the third quarter; on the shield the Steel Crown was placed, as a symbol of sovereignty and independence, after the Romanian War of Independence. 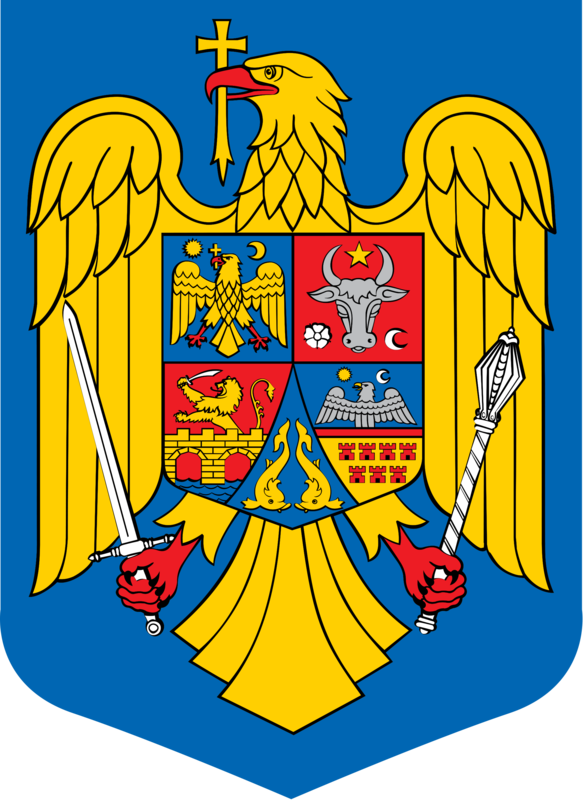 The coat of arms remained unchanged until 1922, after World War I, when Transylvania was united with the Kingdom of Romania. Then the coat of arms of Transylvania was placed in the fourth quarter, with the Turul replaced by a black aquila, the third quarter depicted the joined coats of arms of Banat and Oltenia (the bridge of Apollodorus of Damascus and a golden lion respectively), and the coat of arms of Dobruja was placed in an insertion. The shield was placed on the chest of a golden crossed and crowned aquila, as a symbol of the Latinity of the Romanians. The aquila was placed on a blue shield, capped with the Steel Crown. The coat of arms had three versions: lesser, middle (with supporters and motto), and greater (the middle arms on a mantle red lined with ermine). After 1948, the Communist authorities changed both the flag and the coat of arms. The coat of arms was rather an emblem, faithful to the Communist pattern: a landscape (depicting a rising sun, a tractor and an oil drill) surrounded by stocks of wheat tied together with a cloth in the colors of the national flag. 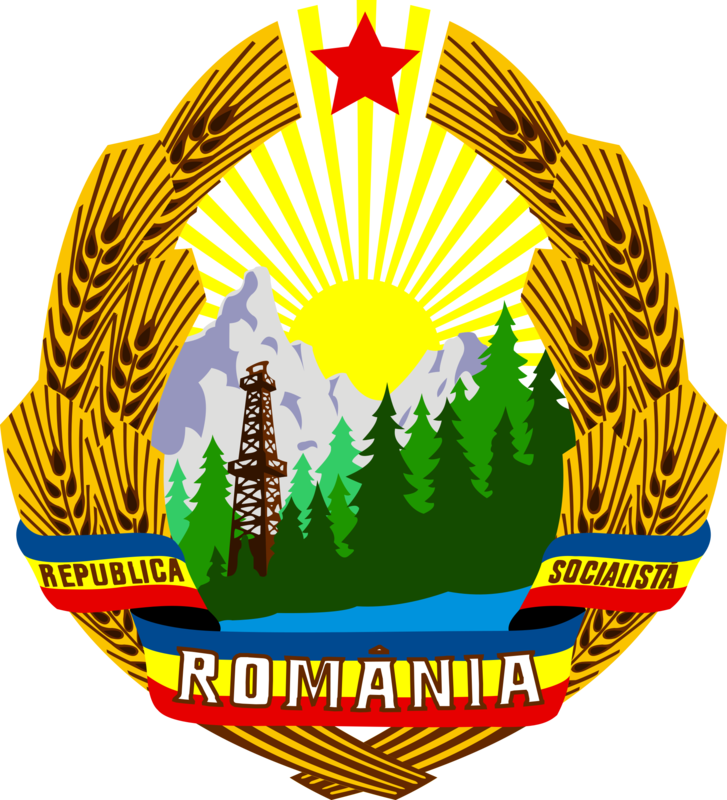 Until 1989 there were four variants, the first being changed shortly after 1948 (the proclamation of the republic), again changed in 1956 (a red star was added), and finally in 1966, when Romania ceased to be a People’s Republic, and became a Socialist Republic. 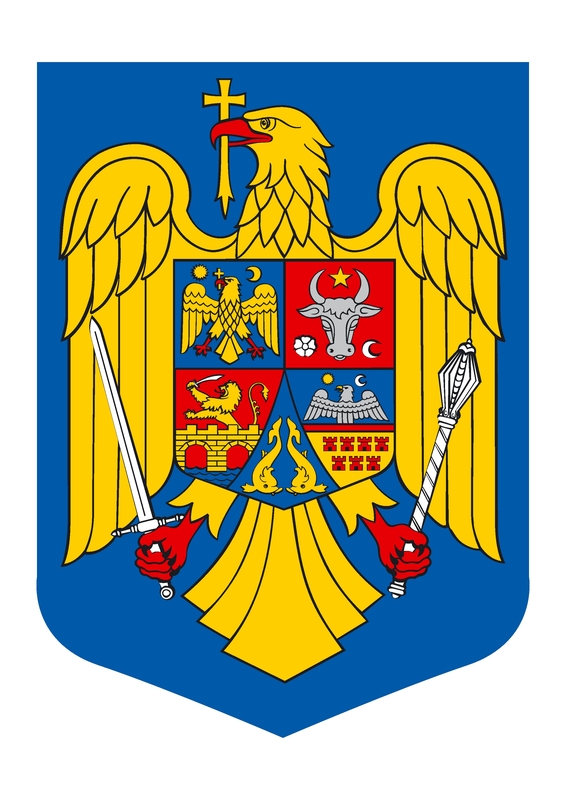 Immediately after the 1989 Revolution, the idea came up of giving Romania a new, representative coat of arms. In fact, the very symbol of the Revolution was the flag with a hole in its middle where the Communist coat of arms had been cut out from. The heraldic commission set up to design a new coat of arms for Romania worked intensely, subjecting to the Parliament two final designs which were then combined. What emerged is the current design adopted by the two chambers of the Romanian Parliament in their joint session on September 10, 1992. This entry was posted on 14 June 2010 at 11:31 am and is filed under Romania with tags Acvila, Blazon, Bour, Coat of arms, patriot, Romania, Stema. You can follow any responses to this entry through the RSS 2.0 feed. You can leave a response, or trackback from your own site. Very, very nice! And useful!